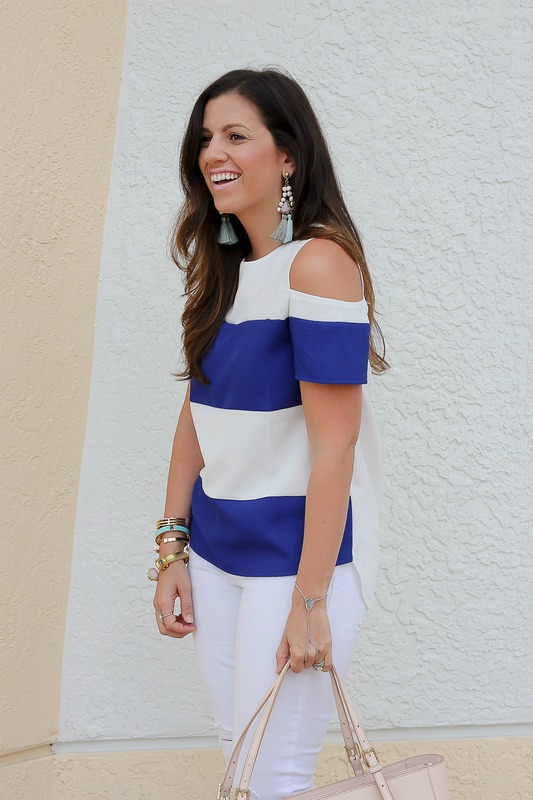 I’m not sure if I’m more in love with this blue and white striped cold shoulder top from Goodnight Macaroon or these BaubleBar fringe earrings, but I’ll be wearing the heck out of both of them all Spring and Summer long! I tend to pair turquoise and royal blue together because they make such a pretty color combo. And it’s no surprise that I’m wearing my distressed white jeans that you guys have probably seen way too often, but hey, at least I’m getting my money’s worth!! Just a reminder for you South Floridians – I would really love for you to swing by Macy’s at the Galleria Mall tomorrow, from 1pm-5pm for their Spring Beauty Event that I’m hosting. There will be lots of promotions and goodies from each of the beauty lines, along with expert makeup artists who will be happy to help with application techniques and product recommendations. Hope to see ya there! This outfit is so cute, perfect for spring!! You look lovely. Love wearing white and blue together. This top looks beautiful on you!!! Great colors! This whole is just perfect! 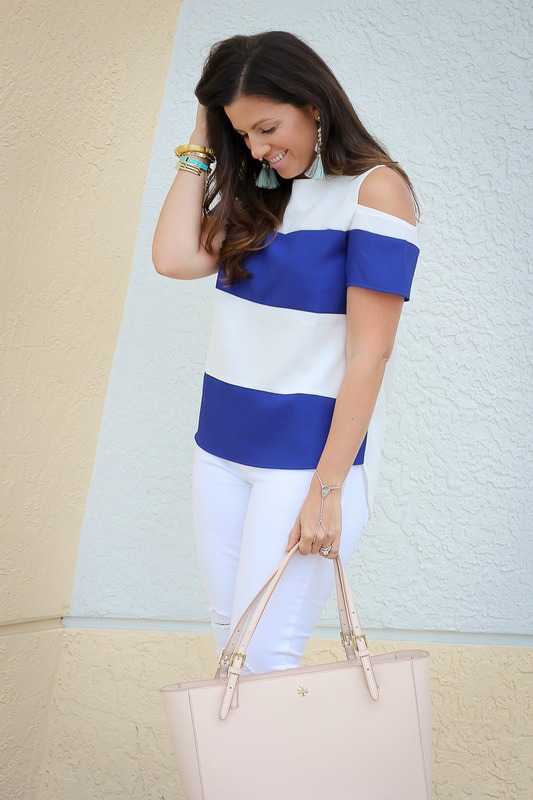 Such a cute top and I love those tassel earrings! You look gorgeous! Love that unique top! Great look! 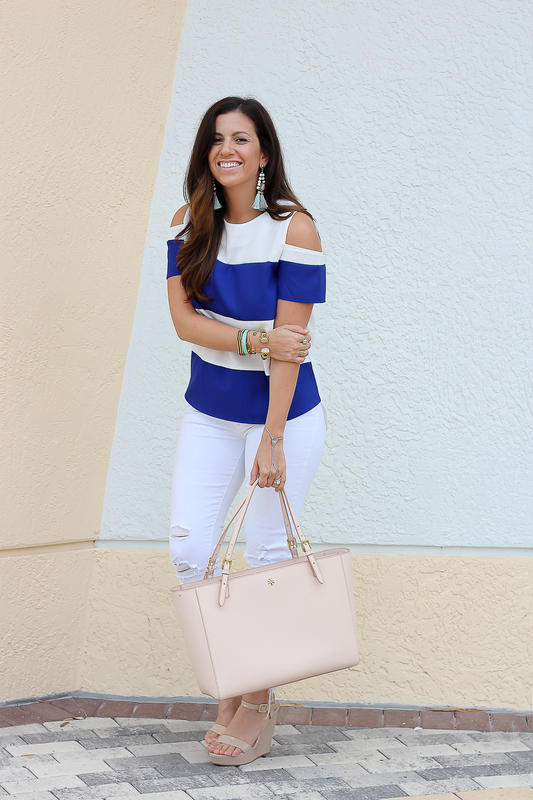 I love a good blue and white combo, and I like the modern twist on a classic blue & white stripped top!